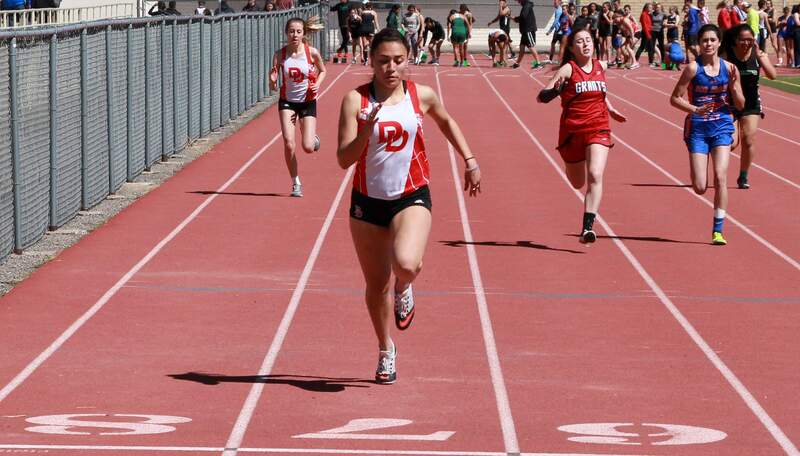 Bekah Moenning anchored the Durango girls 4x400-meter relay team to a victory Saturday in Farmington. 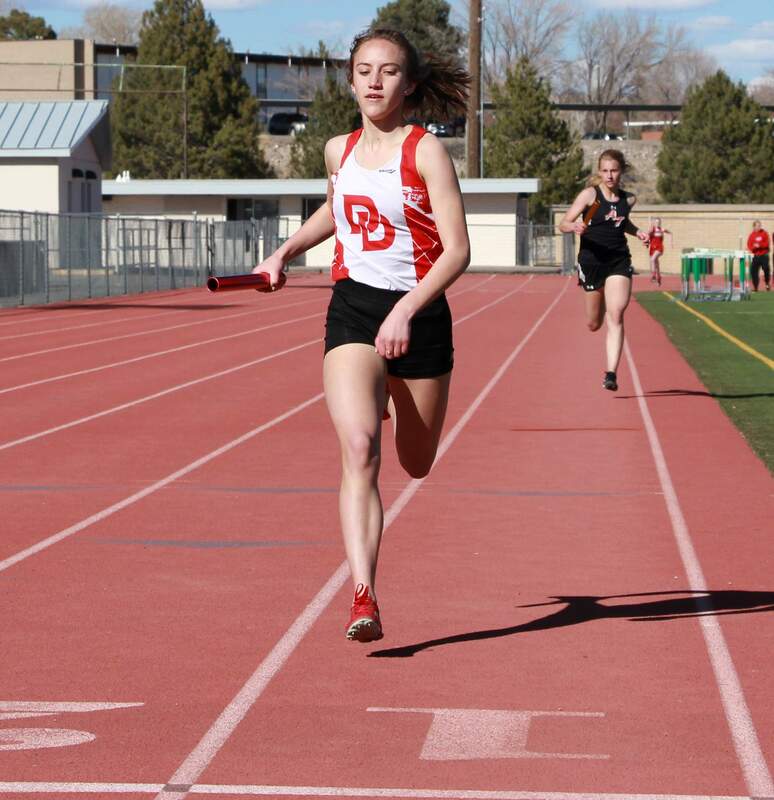 After taking a clean handoff from Emma Fitzgerald, Durango’s Bekah Moenning ran to victory in the 4x400-meter relay. Durango senior Abby Scott appeared in midseason form in only the second track and field meet of the season. Durango’s Teagan Garand ran strong in all of her events Saturday in Farmington. Durango’s Paxton Scott had a strong meet Saturday in Farmington. Durango High School’s track and field accomplishments went beyond racing Saturday in Farmington. McMillan was especially impressed by the effort from his 4x400-meter girls relay team, which won the race in 4 minutes, 22.30 seconds. Aztec was second in 4:25.64. 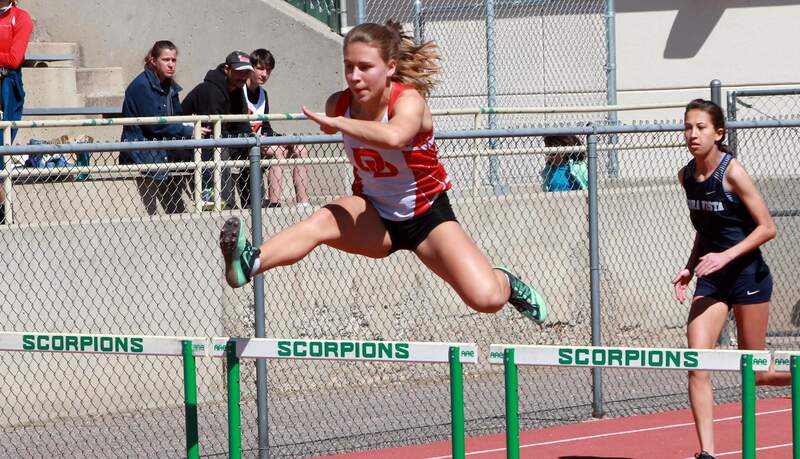 Durango’s Cassandra Blau conquered the hurdles and sprint events Saturday in Farmington. Cassandra Blau ran to first place for DHS in the 100-meter dash. She finished in 13.46. Piedra Vista’s Haley Duran was second in 13.58. Durango’s Teagan Garand was fifth in 13.60. Garand ran to second in the 200-meter dash in 26.95. Haley Golden of Piedra Vista won in 26.49. Blau placed third in 27.36. 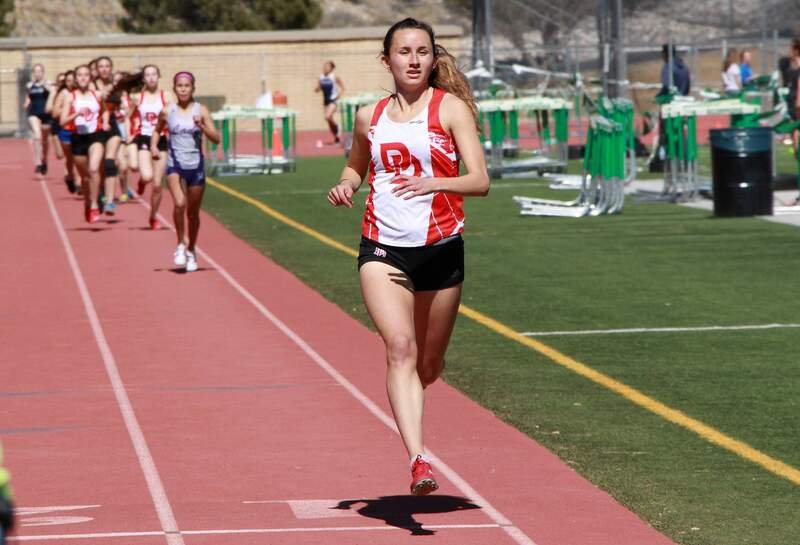 Durango’s Abby Scott won the 800 in 2:18.89, while teammate Bekah Moenning was second in 2:34.09. Emma Fitzgerald of DHS was fourth in 2:39.94. 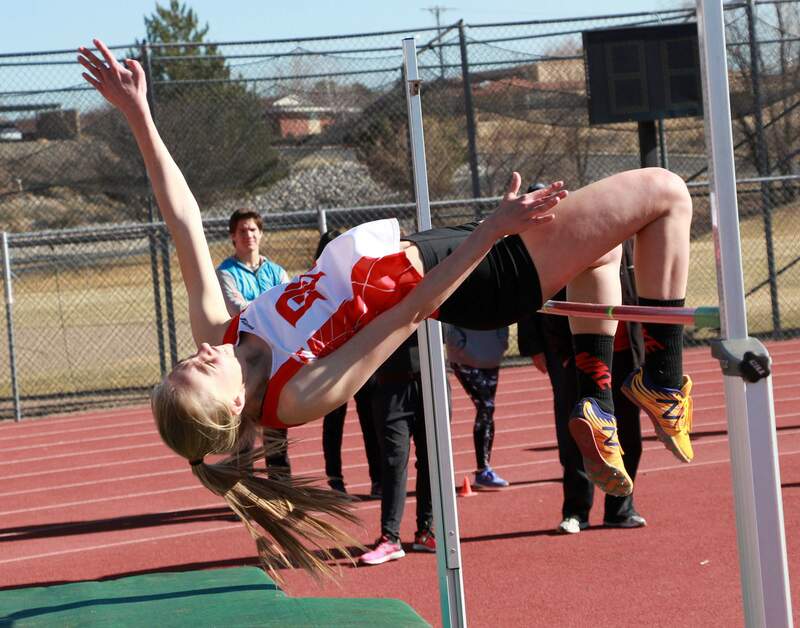 Durango’s Alyssa McConnell won the high jump Saturday at the Farmington Invitational. Alyssa McConnell of DHS was first in the girls high jump at 5-feet, 3-inches. Azalea Santillan of DHS won the discus throw at 105-00. Santillan also was third in the javelin throw at 91-04, and she placed second in the shot put at 33-09.50. Anna Smagacz placed fourth in the 1,600 in 6:08.09. The race was won by Miyamura’s Ashley Thomas in 5:33.84. Chloe Hirst of DHS was sixth in the 400-meter dash in 1:08.45. Kiley Ryan placed fifth in the 100-meter hurdles in 18.43 seconds. Ryan also was sixth in the 300 hurdles in 54.94. Lilah Hwang of DHS was fifth in the 300 hurdles in 53.68. On the boys side, Alex Hise ran to second in the 100-meter dash in 11.18 seconds. Axel Fowler of Farmington won the race in 11.14. 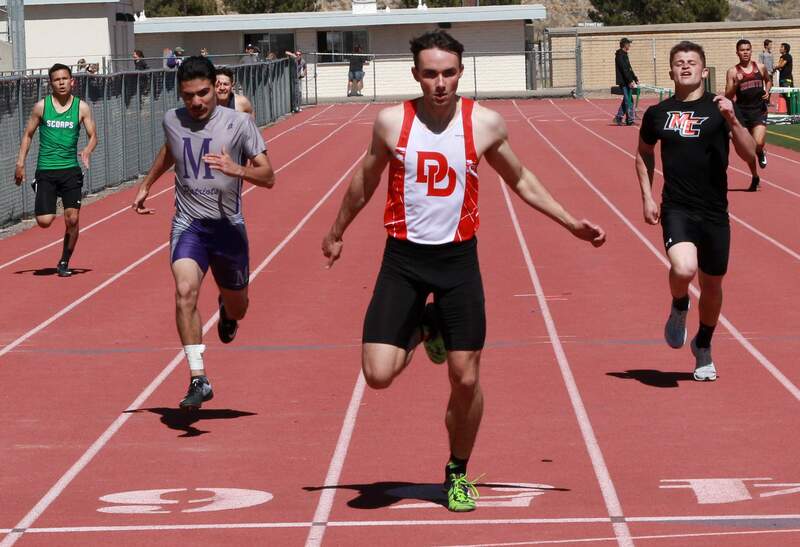 Durango’s Gavin Mestas was fifth in 11.88, and Paxton Scott placed sixth for DHS in 11.94. Durango’s Alex Hise had a meet to remember at the Farmington Invitational. Hise won the 200-meter dash in 23.44 seconds. Los Lunas’ Chris Lafave was second in 23.62, and DHS’ Scott was third in 23.84. Hise wasn’t done, as he also won the long jump at 21-feet, 2.25-inches. Scott added a second-place finish in the 400-meter dash, as he finished in 52.46 seconds. Lafave won the race in 51.92. Mestas was fifth for DHS in 54.41, and Noah Bodewes placed sixth in 55.32. Bodewes won the 1,600 meter in 4:38.75. He was well in front of Aztec’s Andrew Day, who was second in 4:43.88. Durango’s Aidan Fitzgerald was fourth in 4:47.00. Durango’s Noah Bodewes, front, and Aiden Fitzgerald ran together in the distance events Saturday in Farmington. In the boys 800, Ben Bates of Durango placed fourth in 2:09.87. Matthew Smith of Aztec won the race in 2:01.22. 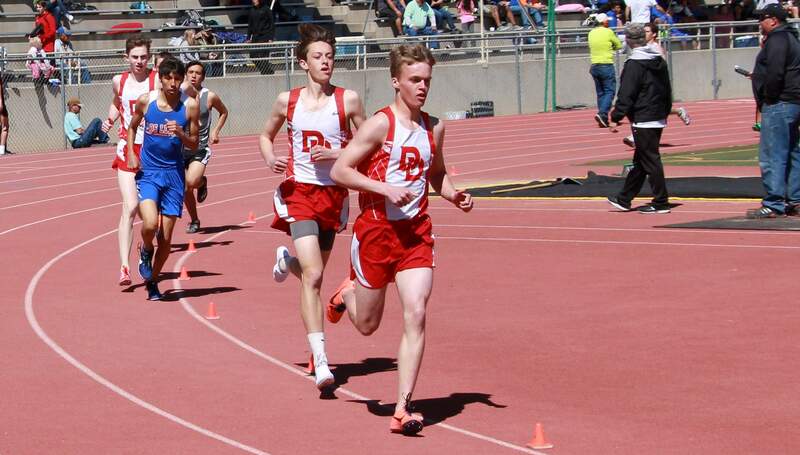 In the boys 3,200, Luke Tichi of Durango was second in 10:38.22, and Paul Knight was third in 10:43.94. The race was won by Miyamura’s Ty McCray in 10:07.88. Cole Waddell placed second for DHS in the 110-meter hurdles. He finished in 17.55 seconds. Farmington’s Justin Williams was first in 15.95. Waddell also placed third in the 300-meter hurdles in 43.22 seconds. Farmington’s Juan Medrano won in 42.11. 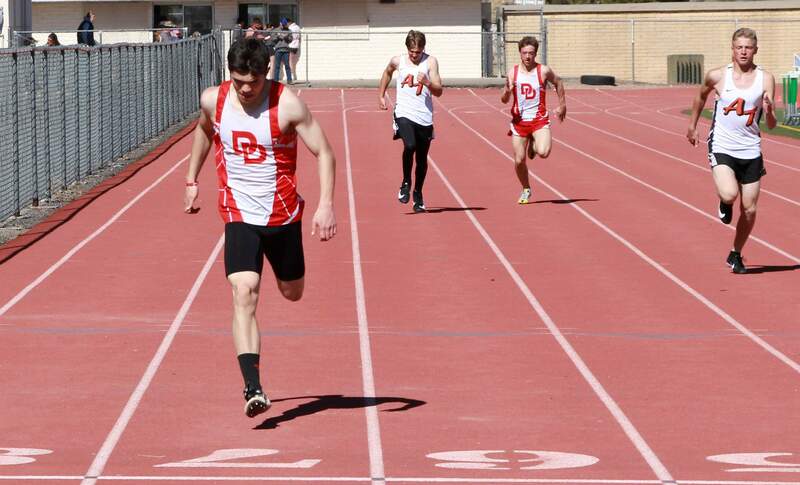 Durango’s 4x100 relay team won in 44.17 seconds. The sprint medley relay team also won in 3:52.83. David Lee placed third in the high jump at 5-feet, 6-inches. Cole Clafton of Piedra Vista won the event in 5-08. Martin Cuntz flew to fourth in the triple jump at 37-05. Dylan Baken was second in the boys pole vault at 10-06, six inches off the winning jump of Piedra Vista’s Tyler Roberts. Braden Evans of Durango won the discus with a throw of 131-05. Durango’s Brian Elvidge Jr. was fifth with a throw of 119-03. Elvidge also placed second in the shot put at 42-11. Bobcat InvitationalBayfield set school and stadium records in Bloomfield. Jordan Lanning won the 100-meter hurdles in 15.94 seconds, and she won the 300 hurdles in 49.32 seconds. She also won the high jump at 5-05 to set a new stadium record. She added a fourth win in the triple jump at 34-00.50. Mikayla Barnes of BHS won the shot put at 35-10.50 to finish ahead of Ignacio’s Aliyana White, who was second at 34-feet. BHS’ Tiarra Christensen was fourth in 31-05. Christensen won the discus at 98-11 to win by seven feet. Barnes was third with a throw of 90-01. Wyatt Killinen won the boys 100-meter dash in 11.75 seconds to beat Pojoaque Valley’s Ricky Sandoval, who finished in 11.84. Carl Heide won the 110-meter hurdles in 15.56 seconds. He also won the 300 hurdles in 42.16 seconds. He blew away the competition in both events. Dawson Heide won the high jump with a leap of 6 feet. Dax Snooks of Bayfield was fifth at 5-06. Dawson Heide also placed third in the 400-meter dash in 53.96, a second behind the winning time of Bloomfield’s Josh Boehm. Bayfield’s girls 4x100 relay team placed fourth in 56.78 seconds. Bella Shoup, Mary Grayson, Hannah Whitmer and Mylee Sanders ran the event. Whitmer also placed third in the pole vault at 7-06. In the boys pole vault, Chad Winkler of BHS was second with a vault of 10-06. Dawson French of BHS was third at 10-00. Ryan Phelps placed second in the shot put with a throw of 49-01. Killinen was third at 47-08, and David Hawkins was fourth at 45-02. The winning throw was 49-06 from Bloomfield’s Colton Barker. Phelps won the discus throw at 147-07. Ignacio’s Natoni Cundiff was second at 129-10. Cundiff also placed sixth in the shot put at 38-07. Bayfield’s boys placed third with 62 points. Kirtland Central won with 151. The Bayfield girls were fourth with 57 points. Bloomfield won the girls meet with 124 points. Ignacio was seventh in both the boys and girls standings.